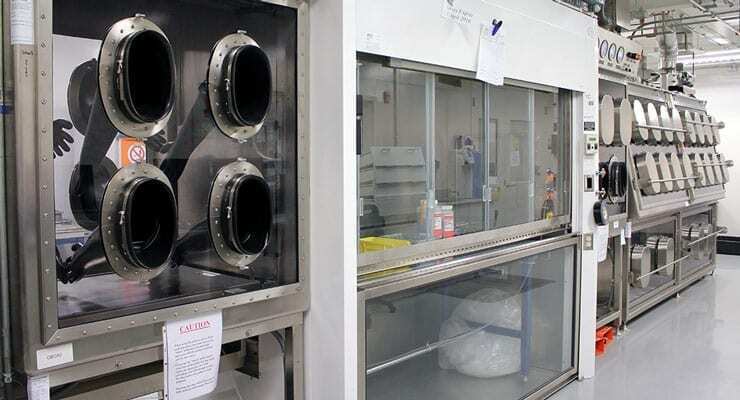 The U.S. Army has developed a one-of-a-kind ‘Non-Traditional Agent Defense Test System’ laboratory, a collection of specialized test chambers designed to test chemical agent protection, detection and decontamination equipment under operational conditions. Development and construction of the testing facility was a multi-year effort with support from across the U.S. Defense Department’s Chemical and Biological Defense Program. The lab is operated by the Edgewood Chemical Biological Center (ECBC), and was stood up in partnership with the Joint Program Executive Office for Chemical and Biological Defense and the Defense Threat Reduction Agency. The lab became fully operational in January 2016, and is the only facility in the world that allows an entire system―rather than individual components―to be fully immersed in chemical agent while under test. Among the facility’s first customers is the Next Generation Chemical Detector (NGCD), a program of record executed by the Joint Project Manager for Nuclear, Biological and Chemical Contamination Avoidance. The program will field four new chemical detection capabilities to warfighters across the Army, Air Force, Navy and Marine Corps. It is the first-ever system designed to detect all phases of matter: solid, liquid, vapor and aerosol. The NGCD is now in the “brassboard” testing phase, with contractors bringing mature prototypes to the Non-Traditional Agent Defense Test System to be tested against a variety of chemicals and conditions. Testing will continue throughout 2016. The facility’s test chambers have the inherent flexibility to address the rapidly changing threat environment that warfighters face on the battlefield. In addition to supporting the Army’s chemical defense mission requirements, the testing facility will support other federal partners in the homeland security and intelligence community, as well as international allies.